Today I am painting a great blue heron sitting on a branch of Red mangrove. I snapped a photo when my husband and I went on a trip to Captiva Island in Florida a few years ago. We had planned to take our kayaks out on the water but there was a red tide at that time. The smell was terrible and almost stopped us from going out for a paddle. A red tide is when a large number of fish die and are washed up onto the shore. It has to due with a red algae that kills the fish. We did however decide to venture out in our kayaks and after we made our way through the smelly water at the shoreline, and passed all the dead fish we ended up having one of the most wonderful paddles ever. We saw turtles and a family of porpoise frolicking in the waters, as well as many shore birds and a bald eagle. Here are the steps I have taken to paint just one of the beautiful scenes from that memorable day. Step 1. 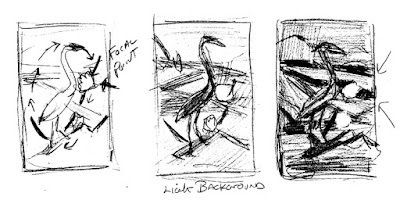 I drew thumbnails of the design. 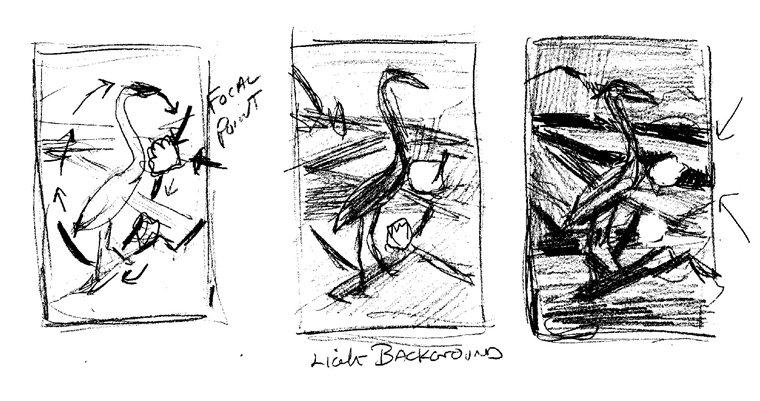 I didn't want the heron to stand out against the mangroves because in nature they don't. They blend in with their backgrounds. I wanted to stress the beauty of the red mangroves and their colorful leaves. 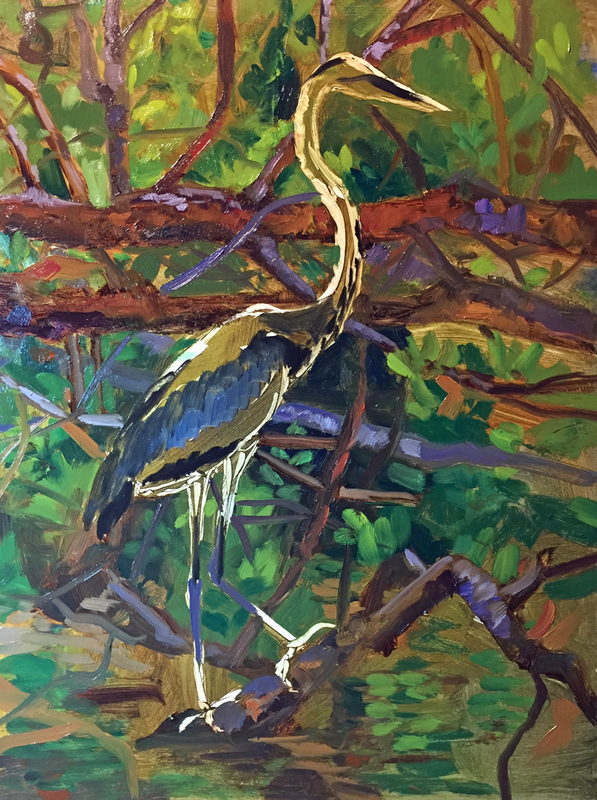 If I painted a light background behind the bird, the mangroves would not be the focal point and the heron would stand out. 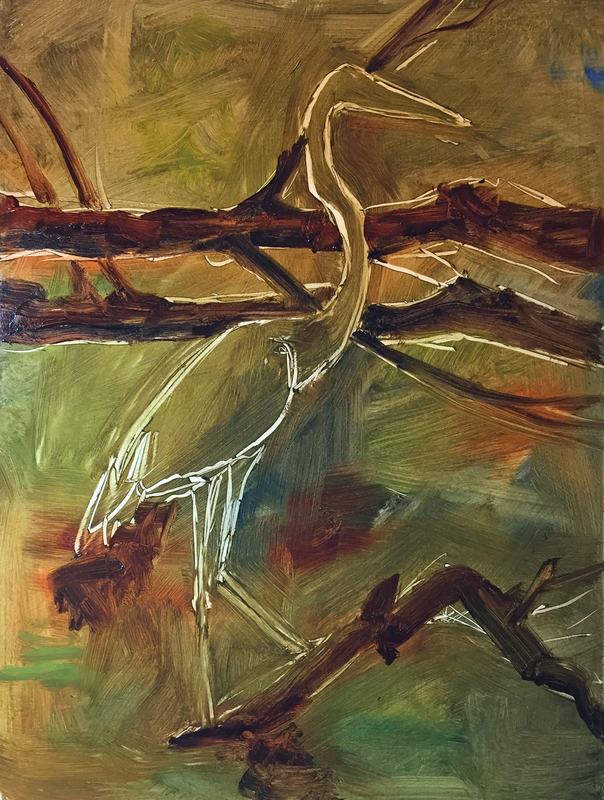 I decided to make the background my midtone as well as the heron and the leaves of the mangrove then become the brightest area of the painting. 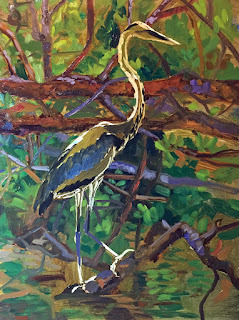 I have blocked in my background and used a wipe out tool to place my heron on the branch. I now start putting in the background leaves and water in a cool blue made up mostly of Caribbean Blue and lemon yellow. I will probably cover most of these in future steps but I wanted a cool blue to peep through here and there. I also have started modeling the branches with burnt sienna and transparent brown oxide. That's it for now. Check back soon for the final steps and the finished painting. I will be posting this 9" x 12" painting on Dailypaintworks.com on Tuesday July 11,2017.
to see more paintings click on the Gallery widget just to the right.